In tonight’s 21st Century Literacies class, my students and I were discussing different types of media, and we completed an activity called “Four Corners on the Media” from Renee Hobbs’s book Digital and Media Literacy. The activity asks participants to discuss what we like/dislike about different forms of media. Then a suggested follow-up activity is to write about a specific media text with which we have a love/hate relationship. That writing prompt made me think of my experience reading Gone Girl by Gillian Flynn. A friend urged me to read the book saying, “I’ve never read a book where I disliked the characters so much and still kept wanting to read.” She was right. I couldn’t put that book down, but before I was finished, I so intensely disliked both of the main characters that I was fascinated by my response. At times I became so irritated with these characters that I wanted to quit reading, but I couldn’t. I was almost reading just to see if something bad would happen to them. This semester I’m asking the grad students in my 21st Century Literacies course to keep a blog, and I’m providing ideas for some of their weekly entries. I’m conflicted about that decision. I worry that providing a prompt makes the blogging experience somewhat artificial. But I’ve also found that when I ask my students, many of whom have limited experiences with Web 2.0 tools, to find their own topics and follow through with a weekly post, they have sometimes been overwhelmed. During their first weeks of blogging, they’re focusing considerable energy on learning the writing platform, so guiding them with to a topic seems to help. I usually begin each class meeting with an in-class writing activity, so many of these weekly topics will be to develop those initial writings into a complete post. All of that was to explain that I’m going to join them in writing about these weekly topics. Last week I asked the students to bring in a photo from their early school years and to write about the person in the photo and her experiences in school. I brought in the official school photo from my kindergarten year. I’m wearing the same dress I wore for the first day of school. I remember how excited I was about that first day. We were in the Roses store in Whiteville when my mother saw on the front page of the newspaper the date school would begin. I asked her then if I could wear my hair in pigtails on the first day. I don’t remember whose idea it was for me to wear this yellow dress, but I think we made that decision in Roses too. The wait for that first day of school was almost unbearable. School was a wonderful place, and soon I would be part of it. But kindergarten wasn’t all fun and magic. Oh, there was much to love: Mrs. Howard, the upstairs kitchen center, my best friend Lori Ann, and story time. I learned so much in kindergarten (I refuse to quote from the poster. ), but the lessons I most remember are the painful ones. Before school, my only child existence had been a sheltered and loving one. 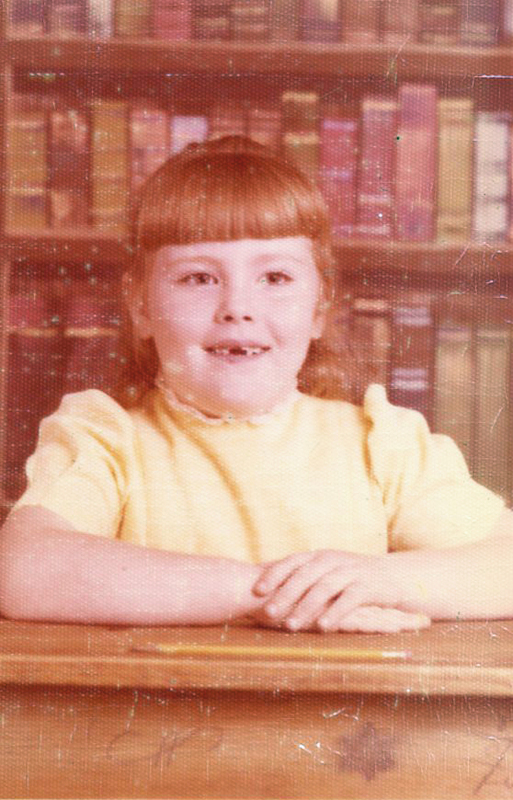 Kindergarten wasn’t always Sheryl-centered, nor was it always loving. From that very first day, I realized that I didn’t get my way in this place. Students who rode bus 73 were given green cut-out buses to wear, and it didn’t matter that I liked the purple buses better. You had to ride bus 64 to get oen of those. That did not make sense to my child’s logic. My mama was still there, and I was going to ride home with her, so why couldn’t I get a purple one? That was my first disappointment, and certainly a lesson worth learning. You don’t always get the purple bus. Other lessons were more difficult. In kindergarten I learned that some people didn’t like me. I learned that the day two little girls refused to let me play with them in the kitchen center. It wasn’t just that I couldn’t play with them; they wouldn’t even let me enter the kitchen. They called me “fatty.” That memory is burnt into my brain. It was that moment when I learned that I was fat and I somehow if felt “less than.” From that moment on, I was less than worthy because I was unattractive. I didn’t automatically expect other children to like me or want to be friends with me. I was always caught by surprise when they did, and I loved Lori Ann even more because she liked me and expected very little in return. Today, thirty-five years later, I’m looking at this photo and thinking, “You weren’t fat.” I even think that girl was kinda cute. The more I look at her, the more adorable she gets. And I’ll bet Mrs. Howard thought I was kinda cute too. Mrs. Howard always made me feel liked and special. If it had told her that the other girls had been mean to me, I am sure she would have responded in an appropriate way because Mrs. Howard knew h ow to make things right. But I didn’t tell her. I didn’t tell her because I was too ashamed. So what’s a teacher to do? Even the best teachers can’t hear every word that’s spoken in the classroom. A child’s ego can be destroyed with one or two sentences, and a teacher who’s busy with another student may never know. It’s a frightening thought, one that makes me wonder how many times it has happened in my classroom. Oh, there’s just so much I would like to say to Gurdon, so much that I hardly know where to begin. My first inclination is to assert that literature is far more than entertainment. When I teach literature, I certainly want my students to immerse themselves in it, but my goal is seldom to entertain them. My goal is for them to experience literature. To experience it to such an extent that they can’t stop thinking about it. To relate, to question, to argue — to think as they read and to continue thinking long after they’ve finished reading. And one thing I have learned from many years spent with fourteen-year-olds is that they already know that there is darkness in this world; they’re experiencing that darkness too often with no sense of how to make their way through it. What they need is for someone to help them navigate the darkness. They look to adults in their lives to acknowledge that the darkness is real and to give them a light to help them find their way. In my role as an English teacher, I’ve found that the best light I can give them is young adult literature. They don’t lose themselves in these books; they find themselves. They walk through with characters who are dealing with problems, the types of problems that are real for many of our teenagers. They identify with the characters’ journeys, and they think. They relate to the characters’ struggles, they question the characters’ choices, and they argue about the wisdom and consequences of those choices. They think, and they take what they learn from that thinking process and apply it the dark threats that exist outside of books. Life is not a fairy tale, and adolescents seldom want to pretend that it is. Life for them can be tumultuous, and literature that acknowledges that tumult does not, as Gurdon suggests, normalize it Instead it normalizes the fear, anger, and uncertainty that accompany tumult. YA lit gives readers a way to step outside of themselves to think about tumultuous experiences. These books offer a safe means of exploring the darkness, and through this exploration, adolescent readers can find a light to illuminate the joy and beauty that lie beyond the darkness. 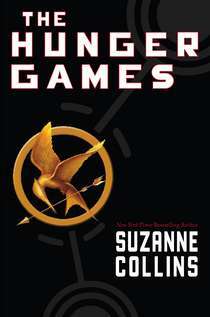 For months friends have been urging me to read Suzanne Colllins’ The Hunger Games trilogy. I’ll admit to resisting. I don’t care much for dystopian fiction; no matter how engrossing the book, I leave the reading experience feeling depressed. I didn’t anticipate that this reading experience would be different. Finally this week my impatience with being left out of the The Hunger Games conversation overcame my resistance, and I dove in. As predicted, I didn’t come up for air until I had finished the first book. Instead of being depressed, I left this book intrigued. Collins has created a fascinating heroine in Katniss Everdeen, and her quest to survive the murderous Hunger Games makes for a compelling story. But what intrigued me most was how the book made me think beyond the story. The book is fiction, and I never forgot that I was reading a story someone had created. Yet even as I read, I was thinking of how this story reflects of our society. At the foundation of this story is a society obsessed with competition and voyeurism. How does that world differ from our 21st century world where we tweet our every action and spend our free time glued to “reality” television? Are the Hunger Games a metaphor, albeit an extreme one, for our own patterns of destruction? Is Integration Allowed in Our Current Educational Climate? This summer I am teaching a course on integrating English language arts and social studies. On Tuesday night I asked my graduate students to consider whether integration truly is possible in this era of high stakes testing. Since then I have realized that I asked the wrong question. Of course integration is possible. Not only is is possible; it is one of the better approaches to instruction. We have both craft knowledge and research to support that fact. What I should have asked my students is whether integration is allowed. Most of my students (27 out of 30) are in-service teachers, and many of them face limitations in how they are allowed to teach. It seems that many curriculum planners and administrators have interpreted the accountability of mandated tests as meaning that the subjects must be taught in isolation. It’s this type of thinking that has led to the now common approach of teaching-to-the-test. So what do we do next? How do we convince decision makers who mandate instructional approaches that the best way to prepare students for tests is to teach in the ways they learn best? Although I have maintained a photography blog for several years (albeit rather sporadically), this blog is my first attempt at writing publicly about education. This semester I am requiring my graduate students to maintain blogs to reflect on our course content and its implications for their teaching practices. I think it only fair that I write along with them.